The present work embodies the result of the carried out by me from 1996-99 for which I was awarded the Ph. D degree by the University of Mysore. I am greatly indebted to Dr. M.S. Krishna Murthy, Professor, Department of Studies in Ancient History and Archaeology, University of Mysore, Mysore who has helped and encouraged me at every stage of this work. I feel proud and happy to have worked under his guidance. I am extremely obliged to Dr. K. V. Raman, Professor and Head (Retd. ), Department of Ancient History and Archaeology, University of Madras, Chennai, for advising me to explore this topic, for encouraging me at every stage of this study and for his personal interest in this work. I am indeed fortunate to have had the benefit of his scholarly advice. I also thank him for kindly contributing the foreword to this book. My sincere thanks to Dr. S. Sankaranarayanan, Dy. Superintending Epigraphist (Retd. ), Archaeological Survey of India and Hon. Director, Adyar Library and Research Centre, Chennai for his substantial help and encouragement. I thank Dr. M.D. Sampath, Director (Retd. ), Epigraphy, Archaeological Survey of India, Mysore for giving me access to the transcripts Superintending Epigraphist, Archaeological Survey of India, Mysore for all his help. I wish to thank my parents for their support and encouragement throughout the period of this work. My special thanks to my mother who has helped me in reading and translation of many of the Sanskrit epigraphs. My heartfelt thanks to shri. L. J. Krishnamurthi and Smt. Shobha Jayaraman for all their help throughout the period of this study. This work (vol. I) Deals with the Sanskrit inscriptions of Tamil Nadu upto c.1310 AD. Vol II, which is to be published, soon is a study of the Sanskrit inscriptions from c. 1310 AD- c. 1885 AD. Inscriptions are the most authentic and vital source for reconstructing the history of India. 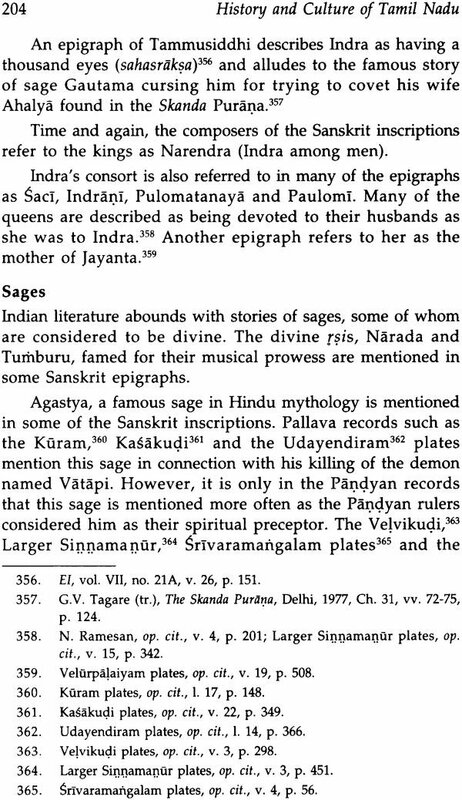 Epigraphs were composed in Sanskrit in various parts of India and the ancient Tamil country was no exception to this practice. 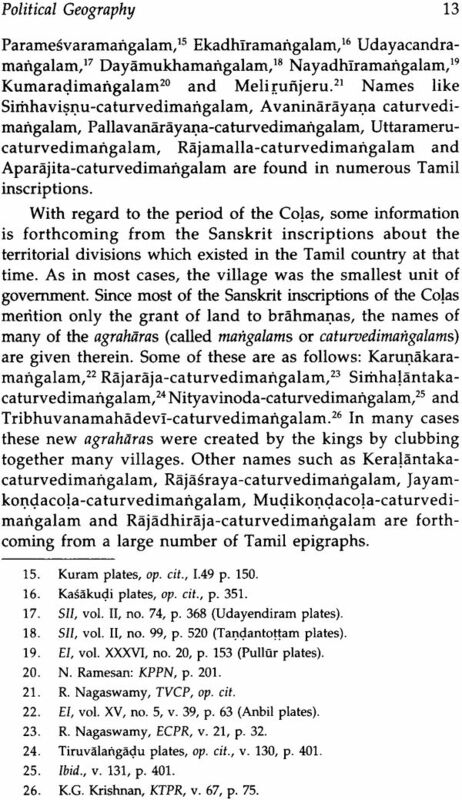 Among the thousands of epigraphs found all over Tamil Nadu, a large number are composed in chaste Sanskrit and these as well as the Sanskrit portions of the bi-lingual copper-plate records serve as an importance source of data about the conditions which existed in the ancient Tamil country. These Sanskrit inscriptions are also excellent pieces of prose and poetry and reveal the high standard which this language had attained in the ancient past in the Tamil country. This is a comprehensive and interesting work dealing with the Sanskrit inscriptions of ancient Tamil Nadu belonging to the period of the Pallavas, Pandyas and Colas and their vassals. It focuses attention on aspects of civil and military administration, social and economic life, education, literature and also the religious and cultural conditions of those ages. This book is a valuable contribution to the field of epigraphy and to the history of Tamil Nadu. Dr. Chithra Madhavan obtained her PhD degree in Ancient History and Archaeology from the University of Mysore. She was awarded the Junior Fellowship in Epigraphy by the Department of Culture, Government of India for the period 2001-2003. Sanskrit is often described as the lingua franca of ancient India and served as a unifying link-language of all the regions therein. The rulers of various dynasties all over India issued inscriptions in Sanskrit and this was the same in the case of the ancient Tamil country as well although they are seen in lesser numbers than those composed in Tamil. The Sanskrit epigraphs of the Pallavas, Pandyas and Colas are a very valuable and authentic source of data for reconstructing the ancient history of Tamil Nadu. 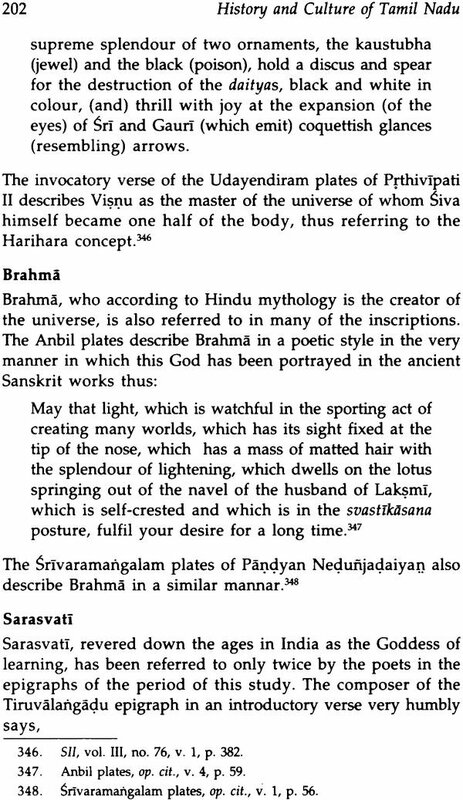 The lithic epigraphs in Sanskrit found etched on the walls of temples, as well as the Sanskrit portions or prasastis of the bi-lingual copper-plate records offer a wealth of information about civil and military administration, social, economic and religious life and in particular about education and literature of the ancient Tamil country which are not forthcoming from any other source. While the data from the Tamil inscriptions have been properly utilized in reconstructing the history of Tamilnadu, the Sanskrit epigraphs have not received adequate attention and have not been comprehensively analysed till now. This work deals with an in-depth study of these epigraphs of the Pallavas, Pandyas and the Colas up to the early part of the 14th century AD and also includes the Sanskrit records of chieftains and those of kings from outside the Tamil country who ruled over this region. This study by Dr. Chithra Madhavan is a significant contribution to the history and culture of Tamil Nadu, bringing to light many hitherto unknown details especially with regard to the cultural and educational aspects. There has been a long felt need for such a work and it has been done with commendable competence. I am sure the scholarly world will welcome and appreciate this interesting study. The great importance of inscriptions lies in the fact that they generally offer information about personages and events of Indian history about which nothing is known from any other source. 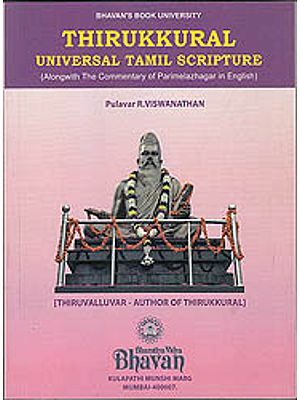 The Pallavas, Pandyas and the Colas, who ruled over the Tamil country from the fifth century AD upto the early part of the 14th century AD have left behind a very rich legacy of thousands of inscriptions which are a storehouse of authentic information about the political, social, economic, administrative, religious and cultural conditions which existed at that time. A proper reconstruction of the history of the Tamil country in the ancient and medieval periods is not possible without an in-depth study and analysis of the inscriptions of those periods, which offer detailed information not provided by any other source. Most of the inscriptions of the Tamil country belonging to the ancient and medieval periods are in the Tamil language.However, a large number of epigraphs are also bilingual, i.e., they are written in Sanskrit as well as in Tamil. In addition to this, there are also plenty of copper-plate as well as lithic inscriptions found written only in Sanskrit. These inscriptions, composed in Sanskrit and Tamil and those written wholly in Sanskrit serve as very valuable sources of historical data. 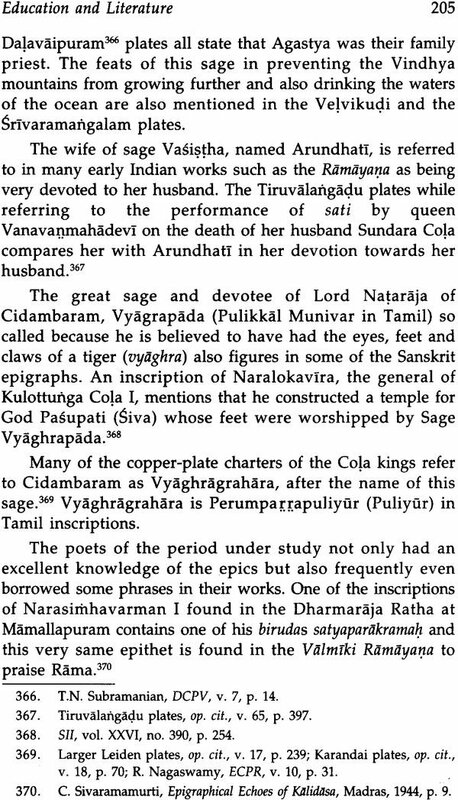 Since Sanskrit was the court language of the Pallava kingdom, many of the official documents namely the copper-plate grants and the royal edicts on stone were written in this language. Since these Sanskrit copper-plate grants and stone inscriptions serve as such authentic and informative sources for the study of the history of these periods, a concerted and integrated study of these Sanskrit epigraphs is necessary. This is the main objective of this work. The attention of the early pioneering epigraphists and historians was focused mainly on the information collected from these inscriptions which pertained to the genealogy and the connected chronology of these hitherto unknown dynasties. This was justifiably so since these epigraphists and historians had first to build up the historical framework from the data culled from these inscriptions. Thus, their writings reveal less emphasis on the social, cultural and administrative aspects contained in these valuable copper-plate grants and stone inscriptions. It is this feeling of inadequacy which impelled me to take up these aspects as the main focus of study in this work. The Sanskrit epigraphs of the Tamil country starting from the fourth-fifth centuries AD upto 1310 AD have been dealt within this work since the former marks the beginning of the Pallava rule in the Tamil country and the latter marks the end of the second Pandyan empire. These inscriptions fall into various categories. Some record political events such as wars and conquests and mention the various military achievements of the rulers. Some epigraphs record commercial agreements and sale and purchase of land. Most of the inscriptions are, however, donative in character. 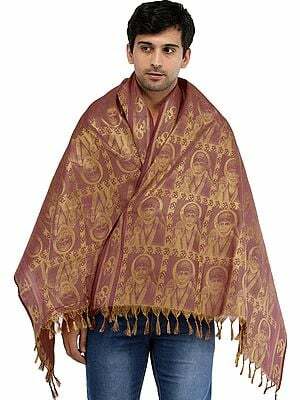 They record the gift of land, money or other valuables by the rulers as well as by private individuals to temples, to other religious institutions and to the brahmanas learned in the traditional scriptures. Most of these gifts, especially the gift of lands were made in the form of permanent endowments and hence the need for engraving them on a permanent medium such as stone or copper-plates, for the benefit of future generations of donees. 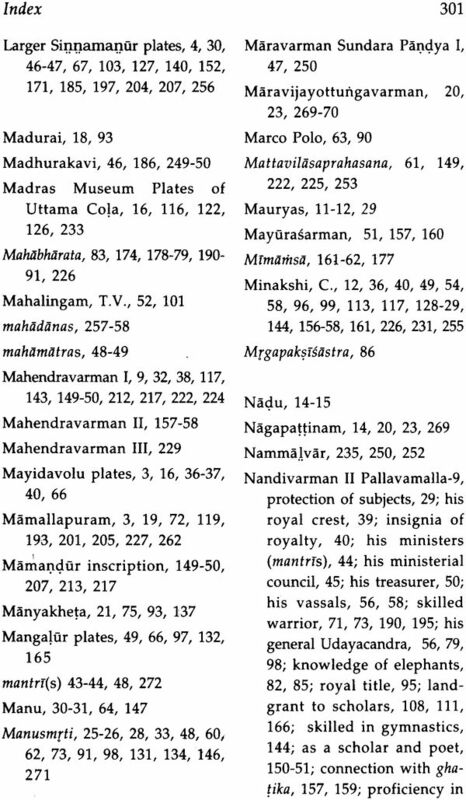 The earliest inscriptions of the Pallavas, such as the Manci- kallu, Hirahadagalli and Mayidavolu copper-plate charters are in the Prakrt language, and the Sanskrit charters are later in date. 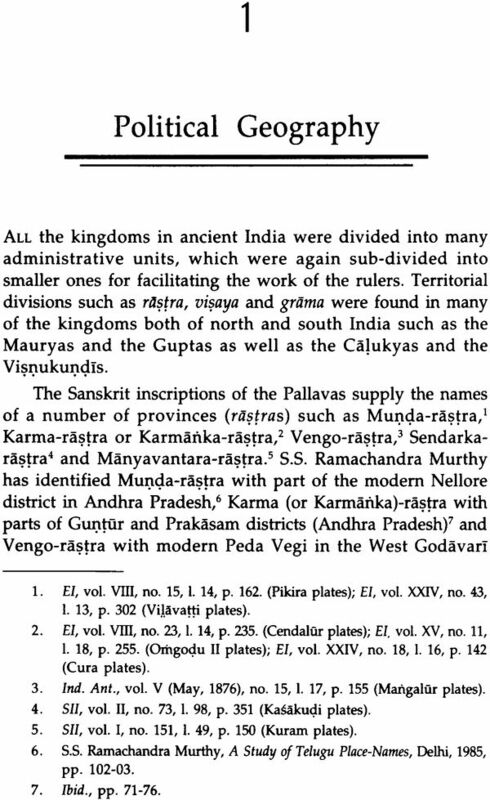 Although many of the early Pallava records, both in Prakrt and Sanskrit have been discovered in the present-day state of Andhra Pradesh, I have included the information culled from these records in this work as these epigraphs have some vital bearing on the topic and cannot be ignored. Some of the important copper-plate epigraphs of the Pallavas which provide plenty of data about this period such as the Kuram plates of Paramesvaravarman I, Reyuru plates of Rajasimha, Kasakudi, Udayendiram and Tandantottam plates of Nandivarman Pallavarnalla and Velurpalaiyam plates of Nandivarman III are bi-lingual, being written in Sanskrit and Tamil, the Sanskrit prasasii always preceding the Tamil portion. There are also numerous lithic inscriptions of the Pallavas, written in Sanskrit found on the walls of the temples built by them in their capital city, Kancipuram, Mamallapuram and other places. 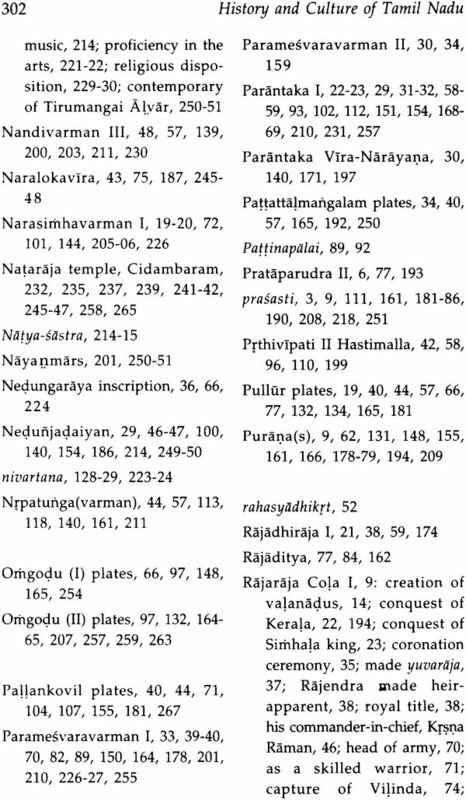 Similarly, with regard to the period of the Pandyas, most of their important copper-plate charters such as the Velvikudi and Srrvaramangalam plates of Nedunjadaiyan, Dalavaipuram plates of Parantaka Vtranarayana, Larger Sinnamanur plates of Rajasimha II and the Sivakasi plates of Vira Pandya" are bi-lingual, while many of their lithic epigraphs are found to be either bi-lingual or fully in the Sanskrit language. 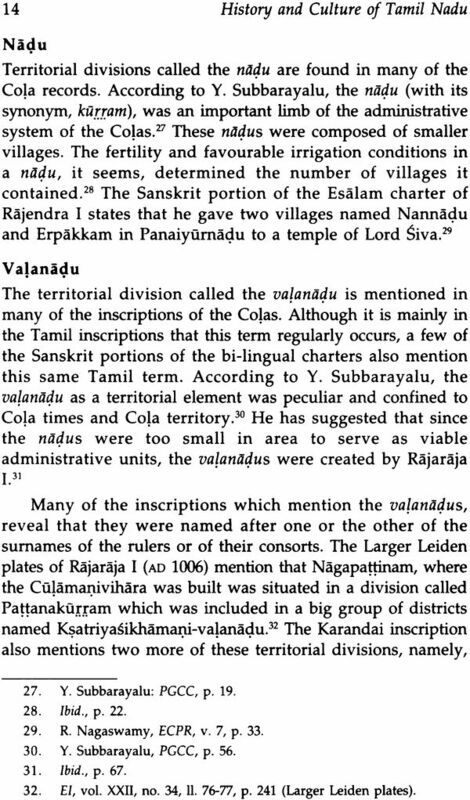 The Colas, who have issued the largest number of inscriptions among the rulers of the Tamil country engraved most of their inscriptions in Tamil, but the number of bi-lingual and inscriptions written' fully in the Sanskrit language belonging to their period are also numerous. 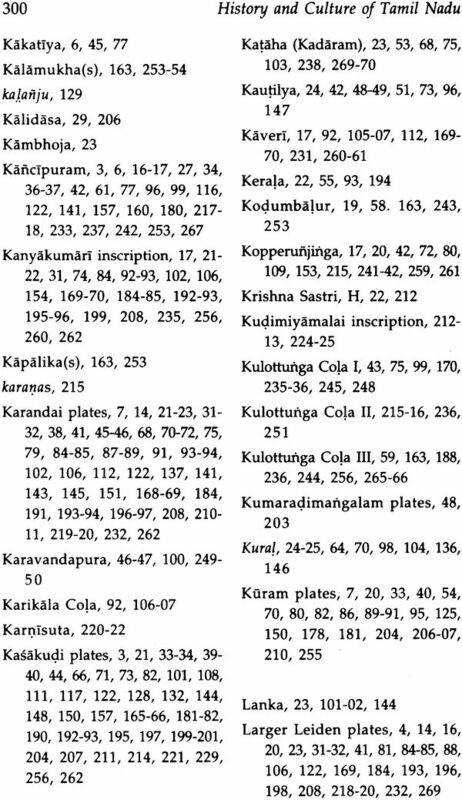 The most important Cola inscriptions dealt with in this study are the Velanjeri plates of Parantaka I, Anbil plates of Sundara Cola, Larger Leiden plates of Rajaraja I, Tiruvalangadu, Karandai, and Esalam plates of Rajendra I, and the Kanyakumart lithic inscription of Vira Rajendra (the Sanskrit portion of which is identical, verse for verse with the Carala plates of the same ruler found at Cittoor district in Andhra Pradesh). 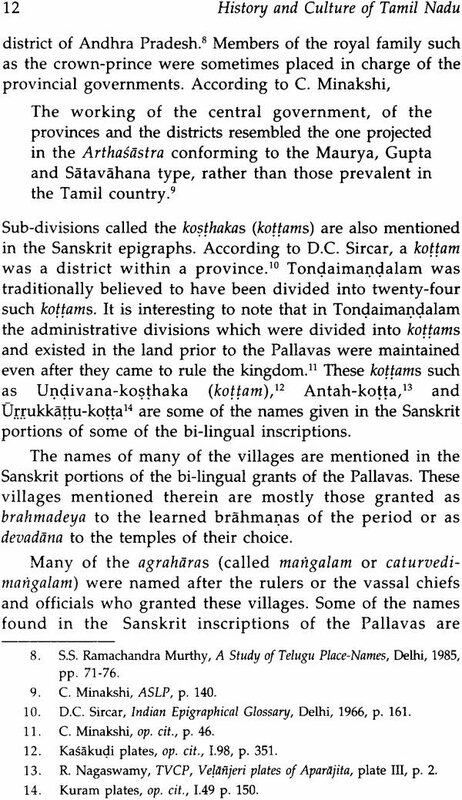 Although the bulk of the epigraphical records, starting from the Pallava period and gradually increasing in later periods are in Tamil, the rulers had all along patronized Sanskrit learning and the Sanskrit language was freely used in the administrative records and transactions. Even in the records which were written in Tamil, Sanskrit expressions have been freely used, especially for technical terms. 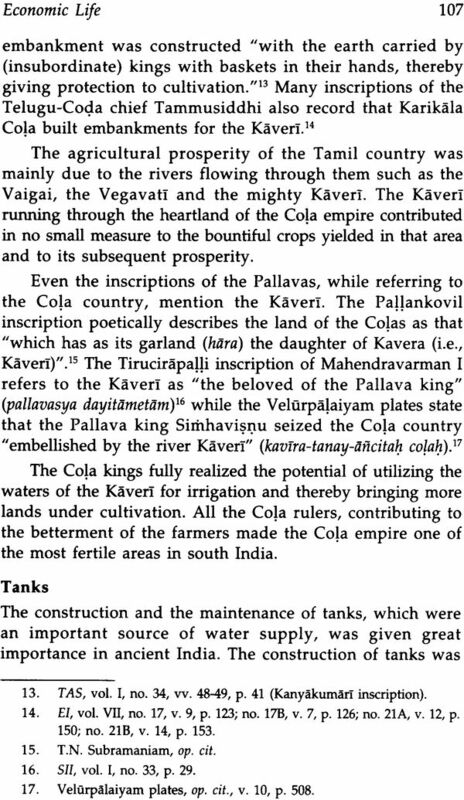 Since the time of scholars of Pallava and Cola history like R. Gopalan, C. Minakshi and K.A. 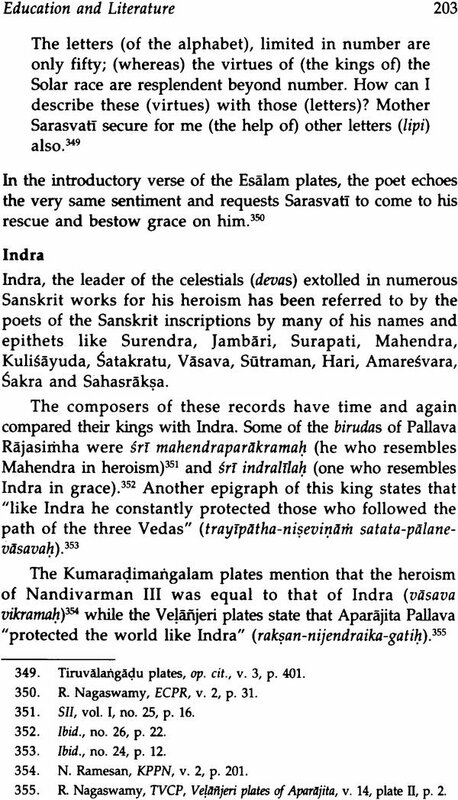 Nilakanta Sastri, many new inscriptions have come to light such as the Velanjeri inscription of Aparajita Pallava the Velanjeri plates of Parantaka I and the Esalam plates of Rajendra Cola I. In this work I have paid particular attention to the Sanskrit epigraphs, especially those which have been discovered recently in great detail to show the importance of Sanskrit sources for writing about the socio-cultural history of Tamil Nadu. Apart from the Sanskrit inscriptions of the Pallava, Cola and Pandya periods, other Sanskrit records of rulers from outside the Tamil country have also been found in Tamil Nadu. To this category belong the epigraphs of the Hoysala king Vira-Ramanatha (AD 1254-95), who, after the death of his father Vira-Somesvara ruled over the southern part of his dominion including the Tamil provinces, while his half-brother, Narasimha III ascended the throne at the Hoysala capital Dvarasamudra (modern Halebid in Karnataka). 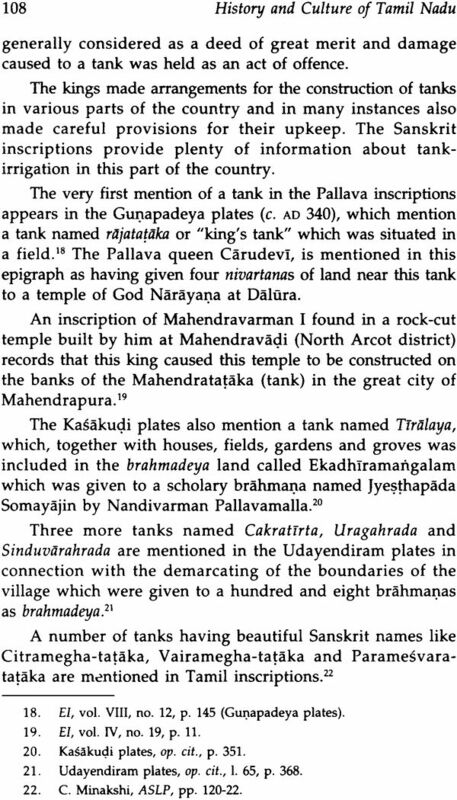 Some of Ramanatha's Sanskrit records have been found at the Ranganathasvarru temple at Srirangam (Tiruchirapalli district, Tamil Nadu)" and Hosur" (DharmapurI district). 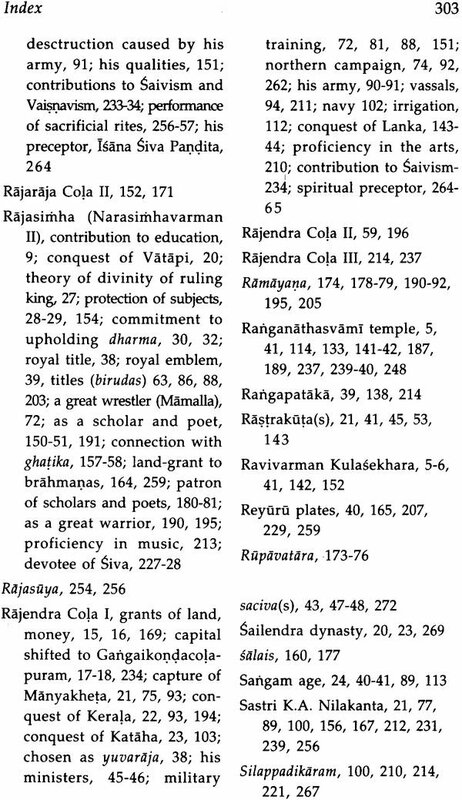 Sanskrit and bi-lingual epigraphs of the illustrious Kerala king, Ravivarman Kulasekhara (AD 1299-1314) who ruled over the Tamil country for some time during the early years of the fourteenth century AD (and who according to a Tamil inscription found in the Varadarajasvami temple, Kancipuram, performed his second coronation in this city on the banks of river Vegavatl in AD 1312-13), have been discovered in different parts of Tamil Nadu like Srrrangam. Kafictpuram and Tiruvadi (South Arcot district). It is known that the Kakatiya rule under Prataparudra Il, spread southwards into the Tamil country in the first quarter of the fourteenth century. A bi-lingual epigraph of this ruler dated AD 1316 has been found in Kanctpuram. The data collected from these Sanskrit records of the Hoysalas, Ravivarman Kulasekhara and Prataparudra Il found in Tamil Nadu have also been included in this work. These Sanskrit inscriptions provide us with cultural links with various other dynasties of south India and even beyond, with regard to judicial and administrative terms, social institutions and language and literature. The Sanskrit epigraphs of this study reveal that the terms and terminologies which were used all over India were used in this part of the country also. One of the main objectives of this work is to bring out the linkages of Tamil Nadu with the pan-Indian heritage and to show how the Sanskrit inscriptions place Tamil Nadu in the mainstream of Indian historical and cultural inheritance. This book is divided into seven chapters. The first deals with the political geography of the period under study as gleaned from the Sanskrit inscriptions. For purposes of administration, the kingdoms were divided into small units which were again sub-divided into still smaller ones. The names of these different administrative units as well as the names of many of the areas in India and also outside the boundaries of India can be gleaned from these Sanskrit epigraphs. The next chapter deals with the administrative system as it existed in the days of the Pallava, Pandya and Cola rulers. The Sanskrit inscriptions provide an authentic account of the position of the kings of the Tamil country. These rulers, as elsewhere in ancient and medieval India were the heads of government. Monarchy was the system of government which prevailed and the king was the undisputed head of the state. The duties of the kings can be gleaned from these epigraphs and they correspond to the injunctions given in the Dharmasastras which clearly outline the responsibilities of the head of state. The main duty of these kings, as elsewhere in the world, was the protection of the subjects and this has been repeatedly emphasised in many of the copper-plate and lithic inscriptions of the period under study. Another important duty of the rulers was safeguarding the uarnasramadharma or the order of the castes. The kings, as the heads of justice and revenue administration enshouldered onerous responsibilities and these can be well understood from the information offered by the Sanskrit epigraphs. The third chapter discusses in-depth the system of military administration in the Tamil country. The Tamil kings were frequently engaged in wars with the neighbouring powers and this necessitated the maintenance of a strong and efficient army. 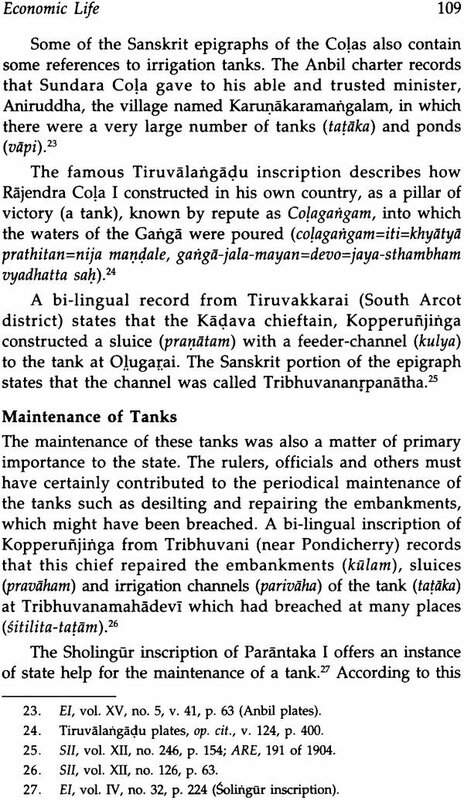 Many of the inscriptions such as the Kuram, Tiruvalangadu and Karandai copper-plates offer a graphic description of the wars waged by these rulers. From these inscriptions, an accurate picture of the military administration of those times can be gleaned. The part played by the kings, generals, infantry, cavalry and elephant corps in the wars, the various weapons of warfare, the nature of wars, the rules and regulations according to which the battles were conducted, and the role of the navy can be gauged from the epigraphs of these kings. In the next chapter, the aspects of economic life as gleaned from the Sanskrit copper-plate charters and stone inscriptions have been discussed. Agriculture was the main occupation of the people of the Tamil country in the ancient and medieval periods as it was in the rest of India also. 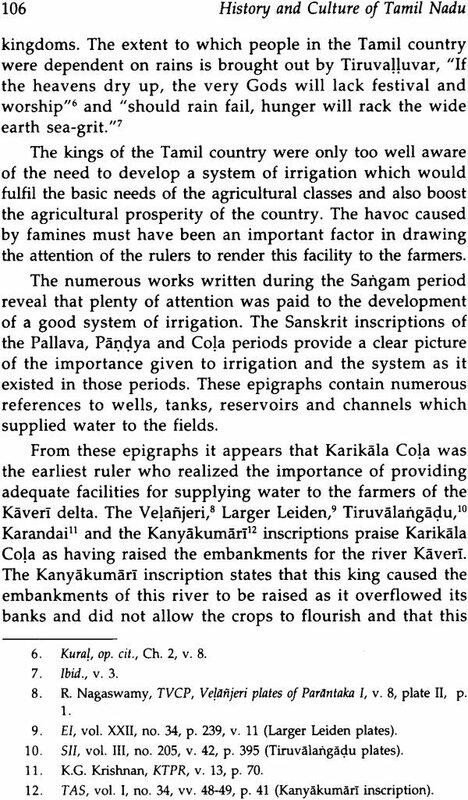 The Tamil kings, realizing the need for making suitable arrangements for the storage of water for purposes of irrigation in case of failure of rains on which the farmers were totally dependent, did their best in this direction. The efforts taken by the rulers to aid the farmers, helped increase the agricultural yield and thereby contributed to the overall economic prosperity of the state. The temple during the days of the Pallava, Pandya and Cola rulers was a centre of socio-economic activity and the Sanskrit inscriptions reveal that numerous employment opportunities were created by this religious institution for the common people. The existence of guilds of agriculturists and of craftsmen are also known from the bi-lingual inscriptions. The epigraphs of the period provide plenty of data regarding the social conditions as they existed in the period under study and these are discussed in the fifth chapter of this work, "Social Life." The four-fold division of society usually found in ancient and medieval India, probably existed - in the Tamil country during this age. 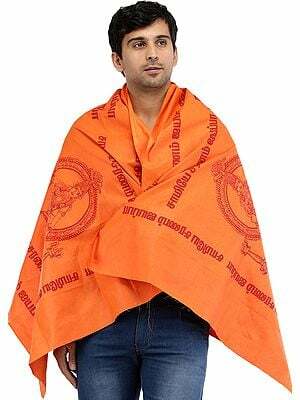 The brahmanas occupied a very respectable position in society and were honoured by the kings as well as by the common people as can be seen from the inscriptions. Information about the queens of the Pallava, Pandya and Cola dynasties and the role played by them are also forthcoming from the inscriptions. With regard to the field of education and literature, the Sanskrit inscriptions provide a lot of information and these are dealt with in the next chapter titled, "Education and Literature." The rulers gifted lands to brahmanas to live in and these agraharas or brahmana settlements, along with temples, mathas and institutions known as ghatikas were the important centres of learning.